I’ve personally been in the business of marketing and sales for over two decades. 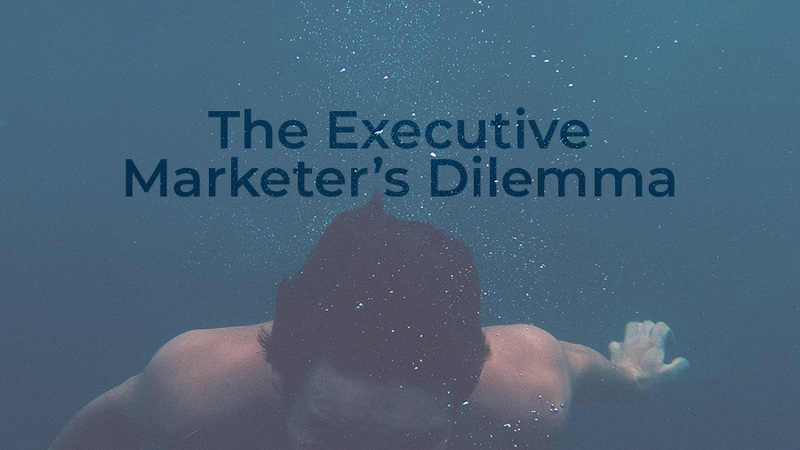 As I see it, there are three major barriers to success for the executive marketer in the present age. Every day as a marketing professional, you go into work with the goal of moving the needle for your organization. You’ve spent countless hours researching and working with your team to produce some of the best creative and to execute on your marketing strategy. Unfortunately, sometimes it just doesn’t translate to the end user and it shows in the lack of results you are getting from your campaigns. Finding your target audience has become much easier in some respects, due to the tools we have at our disposal. However, in a lot of ways it has become much harder to engage and convert those that audience into customers. Since we have so many tools, they can sometimes get in the way of us genuinely connecting to your audience and communicating your message clearly. The answer to this question is simple, but in practice it can be much more difficult. After working with organizations and consumers for decades, my team and I have been able to simplify the problem of engagement and offer a solution that’s been tested and confirmed to work. However, with that solution in mind, there’s a bigger problem to solve – the dilemma every marketing professional faces at some point in their role. Before you can solve the engagement problem, you have to first be clear about the major barriers that stand in YOUR way to get your job done. I’m writing this article to clearly state the main issues that lie in front of professional marketers so they can have 20/20 vision as they move through the field of land mines called marketing. I hope this will shed some light on the barriers you face so you can more readily attack the real problem of engagement. Let’s jump in and break down what I think are the three major barriers to success for executive marketers today. For some of you reading this, you know what I’m going to say. It’s the 800 pound gorilla in the room but somehow it’s not being properly addressed inside your organization. You have found yourself looking down the barrel of your marketing budget with leadership holding the gun. It’s a difficult situation. If it helps at all, I can count on one hand how many clients I know who have had marketing budgets that were not highly scrutinized by their board of directors or that one person in leadership who doesn’t “believe” in marketing. They just don’t exist. All executive marketers are struggling with this problem. Having a hard line on your budget is not all bad. I’ve seen where it has forced a good teams to become great. They had to be more creative with the money they had and rethink how they are getting through. If budget is always the issue, I’d like to push back on that for now and I’ll present a solution at the end for you to consider. Not having enough money to do a great job marketing is a real problem but before throwing the baby out with the bath water, I would ask you to first reconsider one thing – your strategy. In our experience, it doesn’t always take more money to achieve more effective marketing. Sometimes it just takes looking at the problem from a different vantage point. Adding to the difficulty of budget, your team is probably limited as well. There’s a really good chance you’ve been trying to add another content creator for the last 2 years and just haven’t been able to justify the added expense or quite honestly, you don’t have the time to train them. Assembling a team of strategic, creative and talented people that wake up with the mission of moving the needle for the company can be a real challenge. Finding and hiring people who fit the culture you are building can present its own hurdles while you are working to move marketing initiatives forward. Nevertheless, it is always something you are working on. And from our experience you typically end up with one or two rockstars that carry the majority of the weight but this usually still results in having more work to be done than there are capable hands. When it comes to building a great marketing team, the underlying problem you face, is getting them to consistently create engaging content that adds value to your audience and drives the user to a decision. You may need to change your approach, but your team may not be able to handle the change. Let’s take video for example. You know you should be using video more often in your marketing but there are several barriers to integrating that into your overall strategy. Your current brand creative may not be where you like it and therefore you are having trouble visualizing how to translate your message into video and it be effective. You don’t have the staff to put it together from a skill set standpoint or just simply, (there is not enough time) from the standpoint of having enough time in the day. So, it just sits on the back burner, never getting pushed up to see how it could really affect your overall reach or engagement. If you were really honest, you’d probably admit that it’s a risk for you to try out new marketing ideas without being able to prove they will work. You know that you ultimately need to show an ROI or that the money was spent wisely to get approval to start. This is one of the reasons I see over and over with new clients and it is typically why they are stuck in their growth. I see clients all the time that just want to get the website launched or the blog post written or the social media post published. They spend a lot of time just getting things out of the door and they are not evaluating new ideas and how it might help them revise their current outlook on tools, platforms or tactics. Another example of executive marketers having a lack of capacity is how many times I see their key social media channels being neglected. I’m not talking about posting consistent content. In fact, that’s exactly the opposite of what I’m saying. Most marketers are busy making sure they are posting content when they could be doing something more effective for their brand or their audience. What about having a team member actively present on social, creating conversations and engaging their audience? This could be a much better use of a team member’s time rather than churning out another piece of generic content for the blog. Through some of our brand feedback posts, our team discovered big companies like Loft and Advance Auto not paying attention to the conversation happening online without them. Influencers and raving fans on Instagram are talking about the company’s products and their experiences. It is met with a void in those conversations from the brand. They have to remember, social media is a cocktail party. Small groups of people stand around talking about their lives. How amazing would it be if a rep from Loft appeared in your small group of friends when you were talking about your recent shopping experience? They show up and encourage you saying, “that top looks amazing on you!” It would keep you going for months to hear from the brand itself. Something as small as a like from the brand motivates people more than you can know. Capacity is a tough nut to crack. I’ve found it takes rethinking strategy and then rethinking what each person is doing with their time for maximum engagement on the front lines. Doing great marketing with a small team is possible. I will talk more about this at the end. 1. Maintaining and growing the image of their brand and 2. MQLs. Being able to prove they are making an impact to the bottomline in their department is of great concern. Is this what you find yourself thinking about? In large part, you know that you could be doing a lot better, but you struggle with not knowing how. Your position is not unlike that of a CEO or a CFO and the responsibilities they oversee. You are expected to know how to circumvent the most pressing hurdles when it comes to your role. But let’s face it, no one has all the answers, it’s a process of trial and error based on experience and insights. When it comes down to it, as a good executive marketer, you are striving to hit a home run. And with the budget conversation aside, you want to take risks to hit those home runs. But you are experiencing only base hits. You know you have it in you to do more but sometimes it takes an outside perspective to help you get there. The problem of growth is always staring you in the face. I think the single biggest barrier to a marketer having success is not having the right questions to ask about the marketing they are doing. The key to finding an effective strategy is usually based on the questions that you bring to the table. The right questions reveal your best next steps. For example, specifically, if you are trying to increase conversions on a landing page, there are many tactics you could deploy that may or may not fix the issue. But having the right question based on the right context will take you much further. What is the motivation of the user when she lands there? Is what you are saying to her impacting her decision? If you were in her shoes, would you care about what’s being presented or would you click away? Looking at the problem from the user’s perspective brings you closer to knowing what words to type, what color to use, where to send them and what to do next. On a macro level, we did some work with a local community bank who had to completely change their marketing strategy. They realized they were getting squeezed out by big banks and credit unions and had to change their business model. By closely examining a new marketing approach (which was specifically based on the end user), they were able to confirm the new approach to how they provided their solutions. The result meant they weren’t competing with other banks anymore. They were winning customers on a completely new premise of banking. We helped a bank think like a tech company in order to market themselves to several niche audiences. We stepped up to help a national restaurant chain use unproven tactics to win new long term local customers. We helped real estate brokers completely reinvent their digital marketing to target a referral based sales pipeline vs a direct to consumer approach and won big. These strategies were a combination of our external insights and the executive marketers we were working with at these companies. You know your business and more importantly, your audience. When we come in, we bring new questions to spark new conversations about how to reach your audience in new ways. A good strategy is based on the quality of the questions brought to the table. Our approach to strategy is value-driven and results oriented, supported by data and testing. The target audience is the number one priority, then your brand messaging and finally building the bridge between the two with campaign focused messaging and creative to grab their attention and drive them down the funnel. You may think you have a capacity problem or a strategy problem or a budget problem. You may be right about any one of them. However, something I see a lot is the lack of outside perspective to know which one it is and how they work together. This is where bringing in an agency can shed some light on new growth opportunities. Getting insights from an outside team of marketers usually allows an executive marketer to redirect their efforts for more success. Here is a basic framework to use when assessing your marketing for problems. If you are at capacity with your team but you are getting results, you should not have a hard time getting an increase in your budget due to that fact that what you are doing is working. More money and a bigger team should allow you to do more of what you are doing. In that case, looking at an agency to handle these capacity issues can be an affordable and efficient option. The biggest value an agency brings to the table is the ability to hit the ground running with a breadth of knowledge that will compliment your team’s efforts. If you are at capacity and not seeing the desired results, you may need a new strategy. Taking a fresh look at what you are doing can sometimes solve capacity issues. Changing the tasks you are working on may have a greater impact without needing to expand your team. When you improve your strategy, typically your team capacity will be improved to some degree and most of the time your budget becomes less of an issue. However, there are times when an improved strategy means more time from your team and more money from your budget. This is simply the calculated risk needed to make the necessary changes for growth and to find what works for this season of your organization. Beyond the obvious issue of getting your leadership to commit a sizable budget to your marketing department, I’ve seen organizations work with a small budget and make big impact. But, it always comes back to strategy. Understanding what your audience wants and how your brand can deliver, then crafting a message that has impact, is key to solving myriad of problems. If you know where to reach your audience and what to say to get them engaged, you can make a little money go a lot further with a much smaller team until you start having success and want to multiply your results. Did any of these ideas resonate with you? If so, would it make sense to connect for 15 minutes and talk through which of these areas you think may be your biggest concern? Either way, I wish you all the best in your marketing endeavors.